The LVS and CVS systems both utilise laser scanning technology, combined with proprietary software, to measure the exact volume of the material (either loaded in a truck/ trailer bin or flowing on a conveyor belt). The CVS is a high-tech, yet easy-to-use, tool that allows users to see how much material is moving across their conveyor belt. The CVS product release has been highly anticipated throughout the aggregate community. It will provide accurate non-contact volume measurement of quarried materials, allowing you to optimise productivity and gain ultimate production control. The LVS and CVS systems both utilize laser scanning technology, combined with proprietary software, to measure the exact volume of the material (either loaded in a truck/ trailer bin or flowing on a conveyor belt). The Loadscan belt scanner uses a specially designed scan-head, with single laser, to continuously scan the full width of a conveyor belt at high angular resolution to capture accurate volumetric measurement of the material flowing by. The above-belt lidar laser measurement system is ideal for optimizing yield of stone, sand or gravel product streams, and for managing extraction rates and inventory stockpiles. Carey West, owner and director of Loadscan commented, "This is an exciting new product. Customers have been looking for an accurate belt scanner for a while and our development team have done a great job in delivering a system that is simple in design (so it's easy to install) with a software interface that's stacked with functionality. "The CVS is the perfect complement to our truck scanners (LVS) and will complete our customers' volumetric production tracking. And it could also solve production management headaches for many other companies, and industries, that have never used volumetric scanning before. I can see it being adapted to a variety of industry applications." West says that unlike other optical belt scales, which provide some data but don't integrate easily, the Loadscan CVS has been designed to provide hassle-free, insightful reporting. It has extensive functionality options with built-in WiFi 2.4 or 5GHz, onboard HTTP RESTful API for direct data access and network or WiFi remote control. The Loadscan conveyor volume scanner works across all conveyor belts. The standard scan head is simply fixed to the appropriately sized frame, which expands or contracts, for a secure fit to the user's particular belt. With the correct size frame, the CVS can run on any belt from 400mm to 2000mm wide (and can be custom mounted on belts up to 3000mm). And the Loadscan CVS can be used on deep belts, supplying accurate measurement for material quantities that were previously thought to be too great for bulk flow volume scanning. 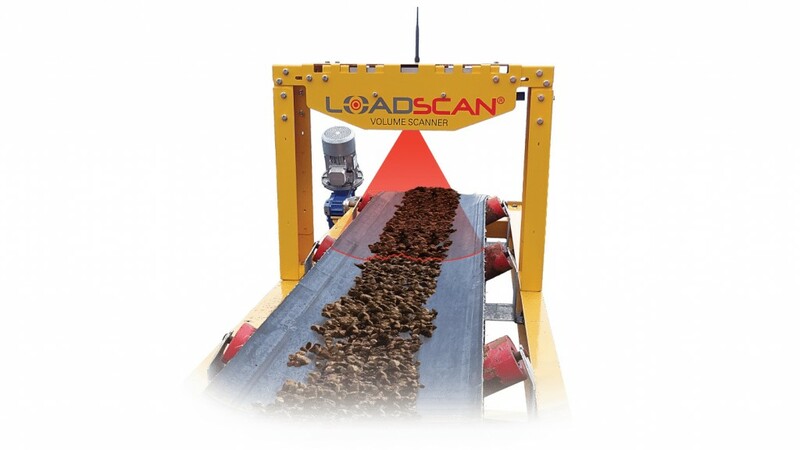 Loadscan have been at the forefront of volumetric measurement over the past decade, pathing the way for easy, accurate load management with their load volume scanning (LVS) systems for trucks and trailers. By adapting their 3D load profiling capabilities, proprietary software, and premier lasers to conveyor belts, they hope to expand upon their reputation for excellence. "Whether you're talking about optimizing truck loads or measuring bulk material flow across a conveyor belt, we're chasing the same outcome, greater efficiency and ultimately improved profitability for our customers" says West. The CVS continues in the vein of Loadscan's tradition of high build quality. It is a robust product that will withstand a wide temperature range in harsh environments. And the hi-spec lasers used in the CVS are class one eye safe, meaning that users do not require any extra protection.